I never see these guys around my house, but this week I found two in two days! This praying mantis was clinging to the window screen on my porch one morning. Mantids are really awesome creatures. They're very good at seeing movement, and are one of the only insects that can move their heads to watch you. 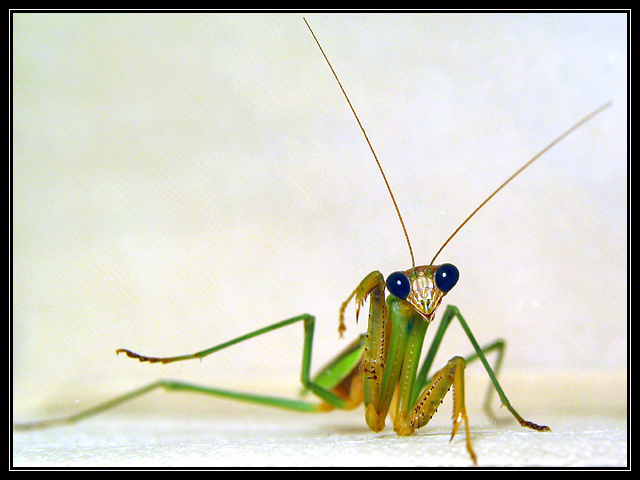 That, along with the big eyes and cute poses, makes them seem much more intelligent than most insects. They're really big and can be hard to catch so I kept her in this tan box with a piece of glass across the top. She's actually sitting on the side of the box, and I was shooting straight down at her. The left and bottom are cropped so that the top edge and corner of the box wouldn't show. Unfortunately, these guys die off fairly quickly when it gets cold, but I did release her back into the yard after her photo shoot. I'm a little annoyed at all the "this isn't rest" comments and votes. An animal or bird sitting is at rest, but a bug isn't? Mantids are very passive hunters that usually just sit still and wait for something to get close enough to grab. Other than moving some legs up and down, this one didn't move for about twenty minutes. Maybe it's too bright and colorful to convey a restful feeling, but the bug definitely IS resting. Nice detail with such a small subject. The neutral & blurred background make the subject pop out. great photo - but his one leg in the air give me the impression that he's moving - if he's not, it still looks that way. However, that said, I grew up working on a christmas tree farm as a kid, and I know for a fact that a praying mantis can sit very still for a very long time...so I will give the benfit of the doubt. I just hope that other people don't judge poorly for the same reason as my initial reaciton. I like the dof, and the framing - very good imo. the textured surface is nice...almost looks like a paper towel or something. nice. sharp and clear. nice work. 8. That is soooo adorable. good use of narrow dof. Great colours, composition. the mantis shot is a great macro, sure you entered the right challenge? it might have been better for this one if all the legs were on the ground. this has an appearance of movement though I am well aware of the the mantis's ability to hold a pose for an endless period of the time. Beautifully captured and what a great composition for this kind of image! Nice use of negative space and I like the way you haven't photographed it in it's natural environment but used the cream backdrop to really showcase the colours. Not sure how well this really conveys challenge topic but a great image! This is a stupendous picture, awesome closeup skills. Right time, right place! Great mantis, but it is not at rest to me. Great macro, I like the colors. Great macro, excellent shot... congrats! this is charming, how did you get the eyes to be black? Usually they seem sort of vacant and pale - in a box? camera draped in black? Great shot. Was this a leftover from the Insects challenge or did you really take it within the last week? Either way its a good shot but saying he's resting is a bit of a stretch. Looks more like he's waving at me. Great macro....excellent really......not sure about the challenge topic though..
Bugs, bugs and still more bugs. Good shot of yet another preying mantis. Are blue eyes a normal colour or did you achieve this through editing? Almost looks like it's waving. You Wow'd me. Great color, composition, and dof. Very nice work. Proudly hosted by Sargasso Networks. Current Server Time: 04/24/2019 09:50:52 PM EDT.